An amazing package for a medium-sized dancefloor, pairing our staff favorite plug-and-play moving head fixture, the ArtFox Flex Beam K8, with the awesome "laser sky" effect of the ADJ Royal 3D II. Mount all fixtures easily to the DuraTruss DT-3900L with included clamps. Crank it up, add a little haze to the mix and party down. 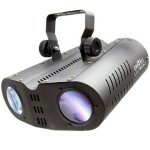 ArtFox Flex Beam K8: A perfect choice for a small to medium dancefloor, emitting spinning, tight beams of multi-colored LED light. 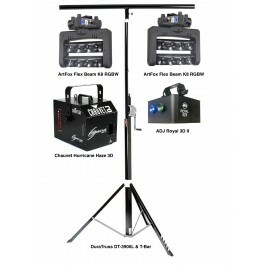 This compact moving head fixture packs a big punch, with built-in sound activated programs and easy linking for a synchronized light show with a huge impact. ADJ Royal 3D II: Intelligent laser features, featuring green and blue beams with the popular "laser sky" effect, along with new dynamic programs that will light up the dance floor.